How Having Cancer Renewed My Faith in Humanity. 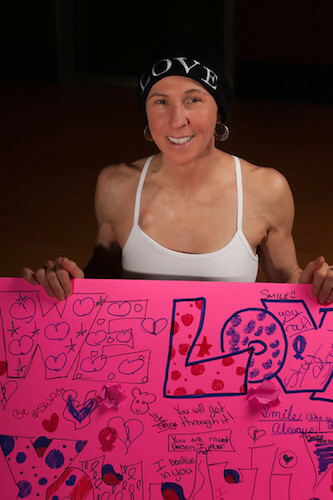 I was diagnosed with breast cancer in June of 2014. Shocking! I am 50 years old, extremely fit and healthy. I had raced triathlons as a top age grouper for 11 years, I am an avid trail runner/racer all the way up to 50 milers, and a yoga instructor/practitioner for years. I am the single mom of an 11-year-old daughter, Lily. I had an axillary lymph node dissection, a mastectomy (all left sided), and chemotherapy. I ran through all of these procedures. I taught all of my classes (I also teach spin one day a week) and showed up for life every single day. My gift is to serve other people, and I do this by teaching yoga and the principles of being a good person and taking care of this gift called our body. I cut off my long hair and donated it to Locks for Love, then shaved it all off. I never once hid behind a wig or a hat. I’m proud, strong, vulnerable. I came to a deeper appreciation of who I am. I am not my hair. I am not my body. This journey has also renewed by belief in humanity!!! So many people showed up to make me meals, bring me flowers, cards, gifts, money, and offers to care for my daughter . I am surrounded by so much love and compassion and selfless giving. Believe me, it’s been a tough journey, fraught with tears, side effects, confusion, anger, and pain. But to me the lessons and the wisdom gained and shared far outweigh all of this. I’m a survivor and inspiration. Photos:By Bobbie Turner at 5280 and Elizabeth Hagen Photography. Via the author, used with permission. Im sure every kid hates seeing their mom bald but some people need every one to know or they want to make a statement about cancer or beauty or whatever and thats what matters to them!!! Whatever gets you through this right????!!! Nice photo it caught my eye! I'm also a single mom and cancer survivor. My daughter was the same age when I had breast cancer 6 years ago. I chose to go bare headed during chemo. I always admired women who did that. I had hard days but all my friends called me Warrior Woman! Cancer didn't stand a chance against my spirit. I was proud being bald and beautiful. But after a few months my daughter broke down in tears. She was always supportive of me. But she admitted that she was ashamed. Not of me! She was ashamed at herself for being embarrassed of me. I felt terrible for her. If I wasn't a mom I could have made a different choice. But I had to put my daughter first, she was only 12. I love her more than anything she is the center of my life. SHe was already going through so much. So for me the unselfish thing to do was make it easier on her. I wore a scarf or hat until my hair grew back. Which it did fast, and god willing I continue to be cancer free. One thing I learned as a cancer survivor is, every situation is different. There's no right way to go through this. I'm not here to judge! It looks like the author's doing well and so is her daughter who is gorgeous by the way! Thank you for sharing. 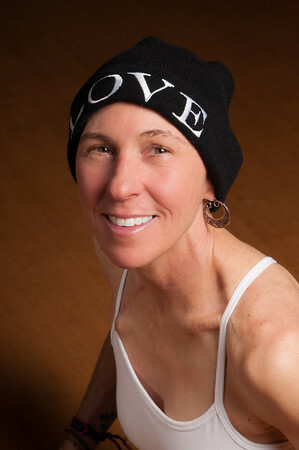 Juli Dabiero Clark is a yoga and fitness instructor in Boulder, Colorado. She is also an editor, single mom. She loves yoga, trail running, biking, cooking yummy, healthy food, and indulging in our many local microbrews! Her gift to the world is to help others realize how amazing they are!